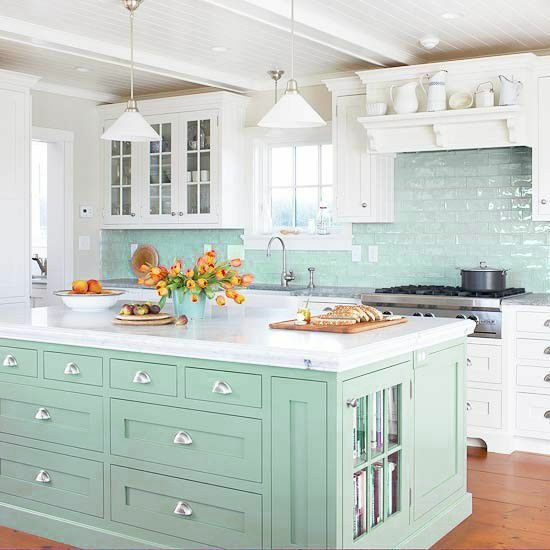 I love a bright sunny kitchen…..and Today there are so many options in designing your dream kitchen. A simple trend in designing your kitchen, that I love and is simple and achievable, is to just add a pop of color to a neutral based kitchen. If you choose this trend, spend a little extra money on quality products. Invest in impressive lighting over the island, this is the room’s main focal point, and lighting helps to create your kitchen’s ambiance. Another notable focus point is the kitchen’s backsplash, either behind the kitchen range or through out the walls between the cabinets and appliances. There is a variety of tiles to choose from today-including stunning glass, natural stone, ceramic and porcelain tiles, each type has it’s pros and cons, so do your homework. Next, add a few sensational kitchen stools, a jazzy kitchen rug, a few pieces of fetching china or pottery to display, and always on my wish list…fresh flowers…seriously they always make every room more beautiful. The shimmer of an iridescent tile backsplash calls to mind the glint of sun on crystal-clear water and pearly shells beneath the waves. Bring a touch of color to a white kitchen with a touch of nautical style elements. This kitchen is gorgeous, I love the designer choice to let the view be the star of this room. The nautical blue and white kitchen stools, flowers and greenery is all the color this kitchen needs. I love a roman shade in a kitchen, pick out a pretty fabric and find a local seamstress and voila…you have a beautiful window treatment that has your signature look.